A personalized, full service, multi-lingual immigration law practice focusing on complex litigation and administrative immigration issues. Representative clients range from large companies to families from Australia to Zimbabwe. In addition to offering traditional immigration services, we offer strategies for complex immigration issues before the Board of Immigration Appeals and federal courts in addition to advising employers in W-4 and I-9 compliance, servicing stateless individuals, wrongly detained U.S. citizens, filing health and religious waivers, and waivers of the labor certification for those aliens whose work is in the national interest (EB-1 and EB-2 cases). Traditional Immigration: Non-immigrant visas, Residency through Employment and Family, Naturalization, TPS and DACA. Our attorneys are award-winning, heavily active in the community and in efforts by the American Immigration Lawyers Association. Both are rated by Martindale Hubbell as having “above-average ability and unquestionable ethics”. 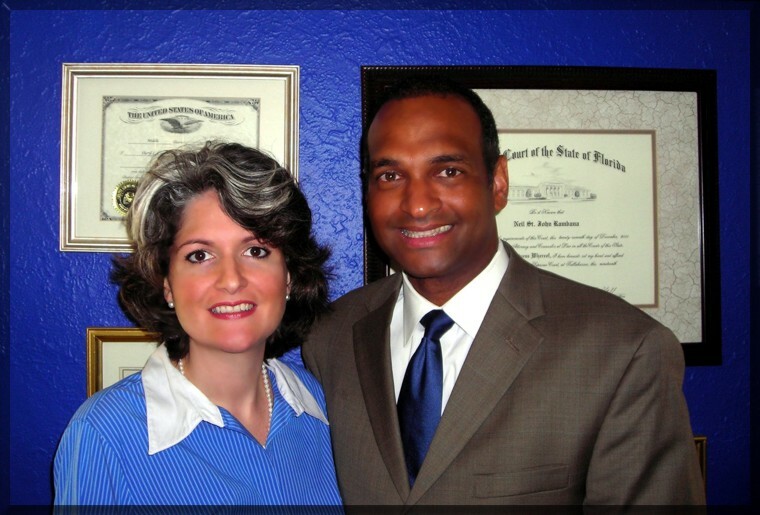 Both Mr. Rambana and Ms. Ricci lobbied Florida policy makers in Washington to pass Comprehensive Immigration Reform. Rambana & Ricci, P.L.L.C. offers free seminars entitled "How to Get the Green Card" and "I-9s: What Employers Should Know" to groups of ten or more. Please contact us for details. Follow us on Facebook for breaking news. 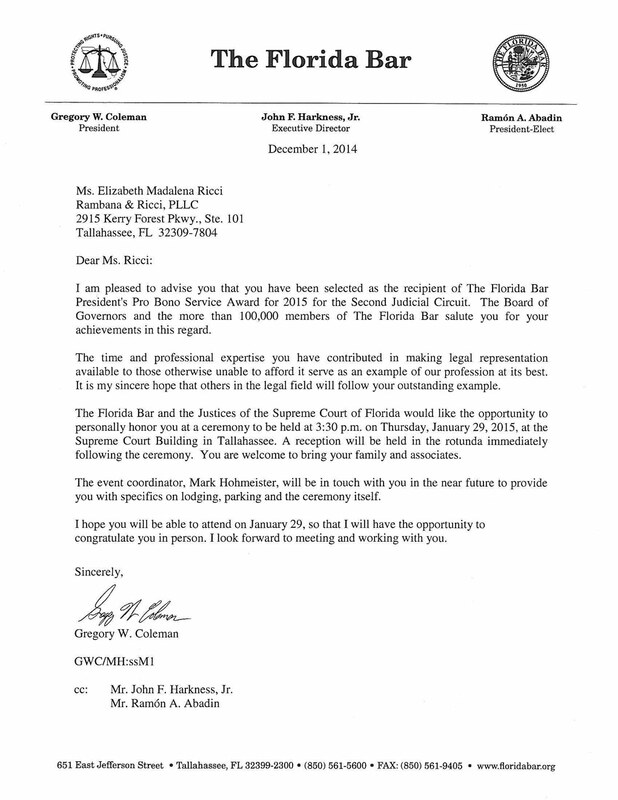 Attorney Elizabeth Ricci is being awarded with the Florida Bar President's Pro Bono Award for 2015 for the Second Judicial Circuit! The prestigious honor is for her hard work and dedication "for the public good". We will post pictures from the ceremony at the Florida Supreme Court next month! 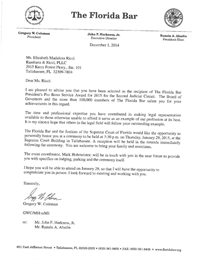 I am pleased to advise you that you have been selected as the recipient of The Florida Bar President's Pro Bono Service Award for 2015 for the Second Judicial Circuit. The Board of Governors and the more than 100,000 members of The Florida Bar salute you for your achievements in this regard. The time and professional expertise you have contributed in making legal representation available to those otherwise unable to afford it serve as an example of our profession at its best. It is my sincere hope that others in the legal field will follow your outstanding example. The Florida Bar and the Justices of the Supreme Court of Florida would like the opportunity to personally honor you at a ceremony to be held at 3:30p.m. on Thursday, January 29, 2015, at the Supreme Court Building in Tallahassee. A reception will be held in the rotunda immediately following the ceremony. You are welcome to bring your family and associates. congratulate you in person. I look forward to meeting and working with you.